Here's a useful, pretty favor that's guaranteed to bring smiles for years to come. That's because your guests will reflect on your happy day every time they see their reflection in these butterfly mirror compacts. 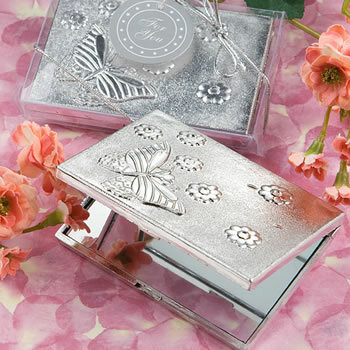 From Fashioncraft's Elegant Reflections Collection, each measures 3" x 2 .25"and is made with a shiny-silver-plated color, hard molded plastic outer compact cover with detailed butterfly and flower designs on top and a hinged opening that reveals a dual-sided mirror interior. Sure to shine as a favor for all occasions, each comes in a clear acetate box, tied with a silver bow and an attached silver "For You' tag. I love this compact also. I ordered 42 of these and have received the order completely satisfied. I think the women of the church will love them. I couldn't believe how fast my order arrived! And how beautiful the little compact mirrors are! I purchased 300 as gifts for a girls school in Zambia. I am sure they will LOVE them!! Cute product. Only gave it a 3 because it was so cheap that it looked like one of those crane game toys. Still, I doctored it up and made use of it. Probably would not order it again. Sorry. Purchased these for my daughter’s last minute 16th birthday party dinner and not only are they a really nice gift but was surprised that they arrived way ahead of schedule! Recommended! The order arrived in a timely manner and even though I haven't opened the box that they are in, they look very nice. Arrived safely - did not open both boxes - but did open 1 merchandise seems to be in tact - Happy with what I saw - I think the ladies at our Church Christmas Luncheon will be very pleased👍 Thank you! My order came on time. Was reasonably priced and is good quality. Perfect for my event. I ordered the silver mirror compacts as an additional item for baby shower favor bags. They were shipped very quickly and packed very securely I didn’t know what to expect as the price was so reasonable.....but they turned out to be really pretty and a wonderful addition to complete the favor bags. The guests loved them! I will order from this company again! . The mirrors arrived in a timely manner (within 1 week, with standard shipping)and I ordered 65. Very pretty and worth the price I paid for them. Would definitely order again from NPF. Using them for a retreat as a gift. Arrived fast, good quality, and affordable price. These mirrors are so beautiful. Everyone loved them. I used them for my sister's bridal shower. They came quickly and perfectly packaged. I’m happy I purchase them and I recommend them to anyone looking for a simply cute and usable favor. I ordered these compacts for a bridal shower and everyone loved them. They’re small enough so they don’t take up too much room in a purse and the design on the out side is very cute. Worth the money and arrived very quickly. Thanks so much! These mirrors were a pleasant surprise. Considering the price, they were fairly sturdy and nicely packaged and well received. I am using this for a 90th Birthday celebration. Nice size. These compacts perfectly represented the biennium we served and were just what I needed to say thanks. Got plenty of ahhs. The butterfly mirror compacts are definitely beautiful. I'm sure that when the ladies open up their gift bags will be in awe. I love my favors, and my guests did too. Great quality and great price. Quick shipping! Ornate matte gold rose design compact mirror from fashioncraft.